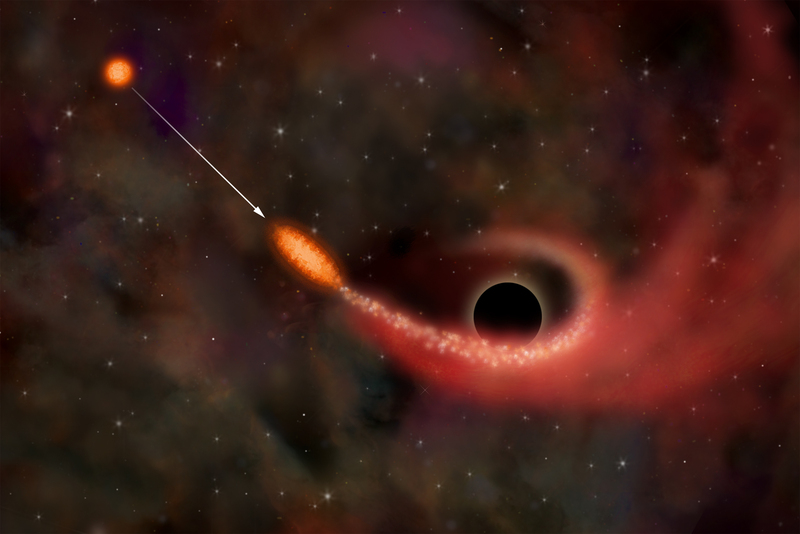 black hole would do to a passing star. All the stars, solar systems, and matter in the galaxy rotate around a central point—the way our planets revolve around the sun. What is that point? What has enough gravitational pull to keep an entire galaxy together? Black holes are collections of matter that are so dense, they have enough gravitational pull to actually keep light from escaping. Remember that even energy is made up of particles...light is made of photons. These particles are so small, that gravity doesn't normally have too much of an effect on them (gravity is the force by which two objects with mass are attracted to each other...the less mass, the less gravity). But a black hole's gravitational force is much more powerful than anything else, so even the photons get sucked in. Black holes have a region around them called the 'event horizon'. The event horizon is the point at which light cannot pass without being sucked in. Think of a magnet. If you suspended a magnet up in the air, and then blew metallic dust particles at it, some would fly past it, and some would get pulled in by the magnet. The area closest to the magnet would keep any of the dust from getting by...this would be like a black hole's event horizon and the dust particles would be like light particles (photons). Any light coming within the event horizon would not get past the black hole. Light that comes close to the event horizon but doesn't enter it might be bent...the gravity would cause it to skew, or even make the light orbit the black hole the way planets orbit the sun. Click Here to Buy Science Related Education Materials.